Auto Meter Phantom Gauges deliver a unique look and legendary dependability with their accurate and precise readings. With clean high-contrast styling, Phantom Series Gauges are incredibly easy to read with a white face, black powder-coated bezel, and fluorescent orange pointer. These highly-durable gauges can withstand the rigors of competition and are well-suited for any car's electrical system. 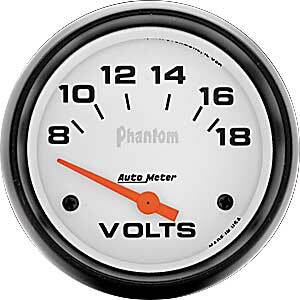 Phantom digital, electrical and mechanical gauges are available in most popular sizes and application readings. Auto Meter Phantom Elite Digital Gauges contain the most current high-end performance instrumentation providing two separate readings. The LED display is surrounded by radial LED indicators that allow you to toggle between various display views resulting in a combination of values. By assigning a parameter to both the radial LED and digital readout you can compare the differences between the two. You are also able to program alarm points that cause the gauge display to blink in order to draw your attention to critical readings. 5891 is rated 5.0 out of 5 by 2. Rated 5 out of 5 by Rangrayy from Great gauge for what I needed bought to finish out/match the rest of the auto meter gauges I bought. works as it should. I used a permatex thread sealer for coolant on the sending unit and is holding up as it should and doesnt affect the temp reading or grounding of the plug. Rated 5 out of 5 by 59Tank from Just wright Just what I wanted a good looking gage at an affordable price , easy to read and install.